Battle for Athens (Click to Purchase, $15, ISBN: 978-1-937536-31-2, Hardcover ISBN: 978-1-68114-162-6, LCCN: 2012912824, 6X9″, 56pp): In 1946, 3,000 World War II veterans returned to McMinn County, and discovered a corrupt and oppressive government that engaged in false arrests, bribery, extortion, and other crimes. They put together an all-G.I. ticket in the town elections. On election-day, Senator Cantrell and Sheriff Mansfield, the corrupted party, engaged in election fraud, even shooting Tom, a black farmer, for voting against them. The veterans acquired guns and mounted a violent defensive revolt. Dr. Anna Faktorovich published a poetry collection Improvisational Arguments (Fomite Press, 2011), Book Production Guide (Anaphora, 2012), and her scholarly book, Rebellion Genre in the Novels of Scott, Dickens and Stevenson, is forthcoming with McFarland in 2013. She has been teaching college English for three years. She has a Ph.D. in English Literature and Criticism and an M.A. in Comparative Literature. She won the MLA Bibliography and the Brown University Military Collection fellowships. She is the Founder, Director, Designer and Editor-in-Chief of the Anaphora Literary Press, which has published over 40 book titles, and participates in CELJ and IBPA. “In the long tradition of narrative poetry, this work will stand out as a worthy addition. The story is clear: In Athens, Tennessee, in 1946, having fought long and hard in World War II, American GIs found themselves once again in battle, this time at home, fighting against political corruption and election fraud. The triumphant part of this story is that in Athens, the veterans succeeded in establishing a fair election. In other cities across the nation, this was not the case. “Writing historical narrative poetry requires a challenging combination of dispassion in the story telling and passion in the stance that the story takes. Faktorovich achieves both. Each poem can be read as a unique element; together, they create the full story and indict the power that corrupts. Further, Faktorovich implies a strong analogy to the processes in which we engage today, questioning our country’s motives and encouraging the reader to think. Aline Soules’ work has appeared in numerous journals and anthologies. Poems from Evening Sun have appeared in Kaleidowhirl, Reed, and Houston Literary Review. Prose poems from Meditation on Woman have appeared in Poetry Midwest, Newport Review, and Kenyon Review. Thank you for inviting me to interview with you in the Spotlight. 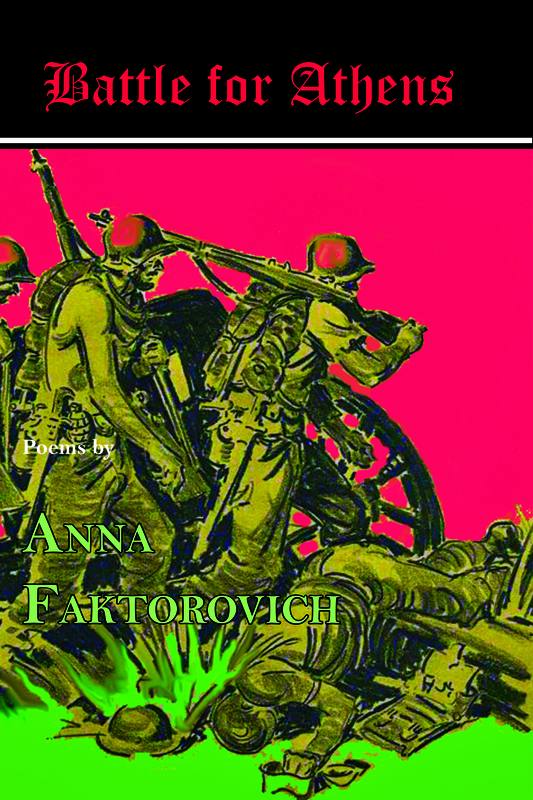 Congratulations on the release of your new poetry collection, Battle for Athens, let’s start there… does everyone ask you what made you come up with the idea for poems about subject? I perform meticulous research not only for my academic books, but also for creative projects. In this case, I was doing a final edit on my Rebellion as Genre in the Novels of Scott, Dickens and Stevenson book that’s forthcoming this Spring 2013 with McFarland, when I had a sudden urge to attempt writing in the rebellion genre to put my theories to a practical test. I knew I had a quick prose-poetry writing speed from the Improvisational Arguments collection that I published in 2011 with Fomite, so I decided to experiment with a short poetry book, rather than trying a novel, which would have been a full-time job for many months. Thus, I knew I wanted to write a poetry book, and one that centers on the plot of a specific historical rebellion. To follow Scott’s structural rules, I chose a rebellion that occurred around 60 years ago, and in my home country, United States. When I looked over the history of rebellions from 1940-1955, there was really only one significant rebellion that happened in the US and this was the Battle of Athens (TN) shortly after the end of WWII. Since I was thinking about the upcoming presidential election, and was personally concerned with the growth of corruption in US politics, and judiciary, this was the perfect historical event for the book. I found several online sources that recounted the events – since the plot was all there, I finished the book very quickly and had a lot of great materials to dramatize and turn into interesting poems. I was especially concerned about corruption in the US because I’ve filed numerous complaints with various police departments across the US and have faced unbelievable corruption in the officers’ unwillingness to fight crime in their neighborhoods. I’ve also seen corruption from regional judges, police chiefs, and local and even state and national officials. It’s possible that I’ve never met a US politician, police officer etc. that was not corrupt. I speak from various perspectives, as I’ve also done half-a-dozen internships with national and local politicians. We always think of how the Civil War divided the country, but “Two Faced Dealings” describes how a single county was divided: twelve units to the Union and eight to the Confederate army… such a haunting thing to think about, and the last line really nailed the horror. And split it in two ideological halves. And eight to the Confederate army. They probably have McMinn in mind. And throwing grenades at each other. This poem sets up the atmosphere and history of McMinn County where the Battle took place. The polarization that was there before the Civil War remained until after WWII and in-part caused the events. If there weren’t too campus – rich and poor, black and white, veterans and non-veterans – there would not have been enough ammunition to kindle a fire that exploded in the Battle of Athens. This historical reality would have been a bit too cliché for my taste without a specific example in the ending. Yes, the example is grotesque and horrifying, and it wouldn’t be appropriate for the occasion if it wasn’t. Tell us about Vestal, who stars in so many of these poems. The long war ended or he turned thirty-eight. Two years after Pearl Harbor. Winning it for the Allied Forces. In battles between Japan and the Philippines. On his USS Missouri battleship in September of forty-five. Clearly their bones from under the crumbled stones. Despite his mostly engineering duties, he was shot twice. This was the man who returned to Athens in March of forty-six. Later in the story, Vestal became offended when his mother was kicked out and barred from observing the voting when she objected to a black man being shot for voting. Vestal and a couple of his veteran friends complained and attempted to observe the vote themselves, but were also escorted out, and as they were leaving with the deputies’ guns pointing at their backs, the crowd outside became enraged and the events that led to the later violence started to unravel. What I felt was so powerful about this concept was that “The Veterans Return” is about soldiers coming home from WWII and finding no jobs could have been written about America’s current situation. In nineteen forty-six, when their contracts ran out. They grouped together and celebrated their victory. When their glasses ran empty, they looked around for work. Getting by on their pensions was about as tough as welfare. And drinking to make up for the sobering years at war. Yes, without a description of the type of uniforms and clothing the veterans are wearing or the type of weapons they were using, the situation is nearly identical to the current crisis of veterans returning from Iraq and Afghanistan to a continuing recession and a growing debt-crisis. Many of them are struggling to find civilian work just like the veterans did after WWII. While US as a whole eventually recovered and became a world super-power, those individual veterans didn’t feel this change, and instead faced numerous problems with adjusting. They might have obtained a high military rank at war, but suddenly they were being told that military skills were not of practical use in peace-time employment. When this was coupled with incompetence and corruption among the local law enforcement officers and politicians, the veterans’ anger spilled out. But, there haven’t been any similar unified outbursts of violence among the veterans today. There are some comical moments too, as in “The Night Before the Ballot,” but overall, it’s pretty grim… was this a fun project? Weeks earlier, Cantrell met with Mansfield. “Go out there, arrest and give fines to anything that moves. And made arrests, deputizing over a hundred. Instead of a speeding ticket, to his surprise and delight. The above details are historically accurate. I just made up the details of what exactly the various characters said, and specifically what they did. These details like the rest of the poems in this book are a dark satire that occasionally gives up on humor and just recounts the horror of the events. I could have exaggerated the events, stretching the truth, to make the book more comical, but I preferred to depict the events honestly because I believe that this type of election fraud and intimidation must be stopped. Yes, I’ll admit that I laughed a lot while I was writing this book, and I did not put in many of the things I was thinking as I was laughing, as I was recalling incidents that I witnessed myself, and they didn’t fit with the story. It’s likely that some readers will see the humor in these poems, while others will be frightened into realizing some of the types of corruption they probably see on a daily basis but haven’t understood what they were seeing before. My goal was to satisfy both of these groups of readers, while also thinking through the serious political details of the events and laughing at their ridiculous nature myself. How do you feel about the election that just took place, and is there some relevance to the Battle of Athens that took place in 1946? I’m writing these replies from Shantou University in China, where I’m working as an Associate Professor. I’ll be teaching at Pima College in AZ in the Spring, when I will shortly return to the US. I didn’t vote in this election, and if I was in the US, I still wouldn’t have voted. The election results for the last 4 or so elections have been identical – always at around 52-48% splits. It is statistically impossible that the American people are split down the middle on all issues. Most people in the US are poor, especially with the ongoing recession, in theory they want more social benefits that democrats offer (even if they fail to meet these offers once they are in office). If the numbers showed this obviously in the middle of the elective cycle, republicans wouldn’t spend hundreds of millions on advertising. I worked for major US banks before, and the pattern I’m seeing in US elections, over the last couple of decades, looks like cooked books to me. We’ll stay in a recession, and will continue to see unprecedented crime, and multiplying bankruptcies in the US until somebody fires the book cookers. Things might be bad here in China, and things might have been bad in the USSR where I grew up, but I might have to migrate elsewhere if things in the US keep getting steadily worst for two more decades. The Battle of Athens happened at the point when the US suddenly emerged as an economic and political world leader. The veterans didn’t know this at the time, as they just knew they couldn’t find work. The vets also knew from personal experience that their local deputies and officials were corrupt, and took actions to resolve this local problem. What we are all watching today is the beginning of the end of the US as a world leader unless electoral corruption stops. Because corruption has steadily spread since WWII, it is not something a few veterans could solve with equivalent means today. Okay, let’s talk some more about the other Anna Faktorovich… tell us about Anaphora Literary Press. I started Anaphora when I started my Ph.D. in English studies back in 2009, and it has been steadily growing out of a scholarly journal, Pennsylvania Literary Journal (tri-annual, available on EBSCO, ProQuest, and in print), to over 50 books in print, including textbooks, poetry books, fiction, and reference books. Many of the writers have received glowing reviews, have been featured in local newspapers, have done readings and signings, and otherwise are successfully published. I have had over a dozen interns per semester working with me over the last year. One of these interns, Catherine Griffin, has an MS in journalism from Columbia University, and is currently doing an interview with Cinda Williams Chima, a New York Times best-selling YA fantasy author of the Heir chronicles, for my PLJ journal. The editorial board of this journal includes Davis Bunn, a novelist that has sold over 7 million copies. I hope to grow Anaphora over the upcoming decades until it also has some best-sellers under its belt. For now, I’m working on at least three different jobs simultaneously to feed this goal. I teach college English full-time, publish critical and creative books and do freelance writing and editing, and work as the Director of Anaphora. These jobs sponsor my regular conference trips to the MLA, Tucson Festival of Books, etc. and mean that I focus on finding the best works in the market rather than solely looking out for profits with Anaphora. Many potential employers ask me why I feel compelled to do all three jobs simultaneously – well, it’s a tough market out there and the way to stay ahead of the competition is to have many safety nets. All of these three projects feed each other – to become a better writer I obtained a Ph.D., and to become a better professor I have to publish, and to become a better publisher I have to understand the business from a writer’s point of view. I have fun when I’m busy working. Those who are interested in starting an independent press should take a look at my Book Production Guide, http://www.amazon.com/Book-Production-Guide-Anna-Faktorovich/dp/1937536254. Can you tell us about your other book projects? As I mentioned earlier, McFarland is about to release my Rebellion as Genre in the Novels of Scott, Dickens and Stevenson academic book, http://www.mcfarlandpub.com/book-2.php?id=978-0-7864-7149-2. I’ve done several public workshops and lectures with the two editions of my Book Production Guide, which I initially wrote to explain my editing policies to my interns. In August 2011, I published my first poetry collection, Improvisational Arguments (Fomite Press), audiences were rolling with laughter when I read from it during my book tour in LA and Atlanta last year. I’ve also written the introductions and conducted interviews for around 10 issues of my Pennsylvania Literary Journal. And what’s next for you? Got the next thing in mind yet? Your Bostonian readers can meet me in person during a “Chat with an Editor” session I’m doing on Saturday, January 5, at 11am, at the MLA at the Sheraton in downtown Boston. This will be a session when I’ll give advice to writers and editors about different policies, guidelines etc. that are a part of my job as the Editor-in-Chief of Anaphora. If anybody plans to attend the Tucson Book Festival in March, 2013, I will be presenting in a panel on publishing, editing and writing. I have a few publications that I’m working on this year. I’m under contract to publish a new book on current popular fiction with them, Formulaic Writing within Genres, next year; it covers genres like fantasy, science fiction, mystery, and romance. I have had some interest from Focus Publishing in my proposal, Creative Composition, a unique textbook for introductory composition classes. I have written many novels, screenplays and other creative projects before that haven’t yet found a publisher. But, they are a bit dusty by now, so I plan on writing a new novel for a popular audience in the coming years; I might start it later this semester, if I have a moment between my other obligations. I hope to find a tenure-track academic job for next year that would allow me more time to focus on fun projects like this Battle for Athens poetry book. Thanks so much for taking time out of what looks like a very busy schedule to talk to us!! It has been a pleasure. I hope to speak with you again when my next creative project is released.